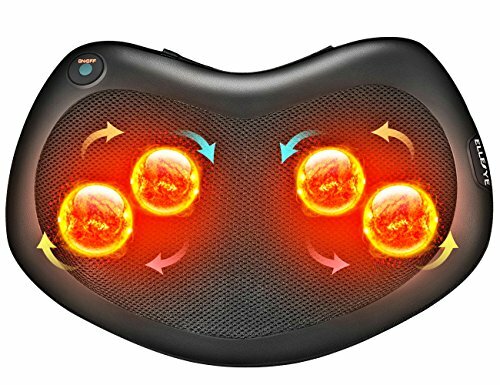 Good for home heat therapy This massager is designed in pillow shape that allowing you to use it at home and office to relieve soreness in the neck, back or shoulders. Its 4 nodes will rotate clockwise or anticlockwise and change rotating direction every 1 minute and automatically shut off after 15 minutes to improve safety. Relieve fatigue after long drives You may suffer from neck and shoulder tension after a long drive. But with our shiyatsu kneading massager, you can relieve your muscle tension at motorway service station. It is not recommended to use it when driving. Low working noise Equipped with premium motor that reduces vibration and brings lower working noise under 50dB which will not fret you when resting your head on the massager. Comfortable using experience With breathable mesh and durable and soft PU leather on the surface to bring a more comfortable using experience. What is more, the back of the massager is designed with elastic straps that with hook & loop at both ends to fix it on the chair or the car seat. Note 1, When using this massager in car, please fix it on the passenger seats instead of the driver’s seat to avoid lack of concentration during driving. 2, Always disconnect the power when not in use. 3, This massager can be use in cars that with 12V DC car charger, for example, sedans, but not 24V large vehicles, such as trucks.